Glasgow: 2.45, South Gate, Faslane. Transport available from Glasgow, leaving at 1.30. London: 3.00pm. Meet in Whitehall Gardens (closest to Embankment station.) and process around the Ministry of Defence to the front at Horseguards Avenue. 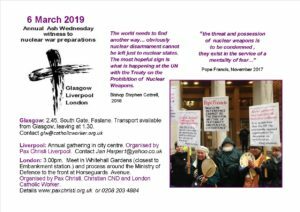 Organised by Pax Christi, Christian CND and London Catholic Worker.